Standard clip on adjustable (and trimable) plastic round eyepatch (also know as occluder). 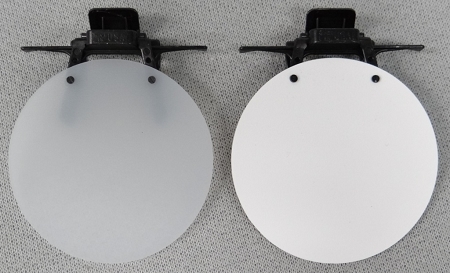 Transparent/Opaque white color allows light to enter the "non shooting" eye to keep your aiming eyes iris balanced. Because of the Transparent/Opaque characteristics this eye patch will allow some light to pass through. SOLID white color does not allow light to enter the "non shooting" eye, no light will pass through. Correct target shooting should be done with both eyes open, and the "non shooting" eye blanked out with a patch. This patch allows the user to flip it down when shooting and flip it up when not, for reloading magazines, scoring, etc. Some shooters believe an eye patch should still allow light to enter the non shooting eye to keep the aiming eyes iris normal. By closing the non shooting eye the aiming eye will over compensate for the lack of light entering and you will lose your focus, resulting in poor scores. *Two eye patches are pictured but you are only purchasing one, please select either the Transparent/Opaque or Sold White or Solid Black eye patches.